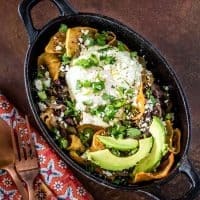 A healthier and vegetarian version of traditional Mexican chilaquiles, Vegetarian Green Chile Chilaquiles are loaded with south-of-the-border flavor and promise to please any time of day! Chilaquiles (pronounced chee-lah-kee-lays) are a traditional breakfast dish served throughout Mexico. At its most basic, tortilla chips are simmered in salsa or mole. Its a great way to use up stale tortillas, or even store-bought chips. 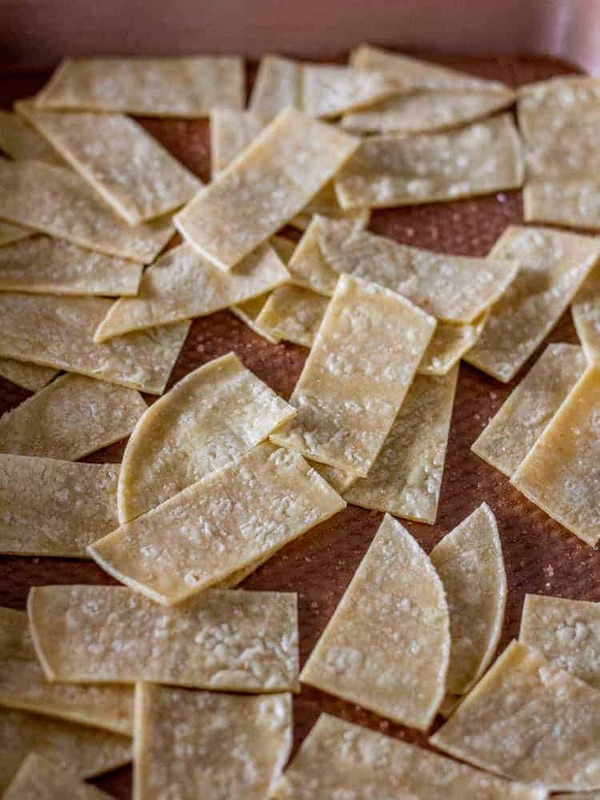 While chilaquiles are served for breakfast or brunch in many Mexican homes, you will find them on the menus of many hotels, restaurants, and even street vendors throughout Mexico. This Mexican comfort dish is a common “hangover cure” for those who over-indulged the night before. Though eggs are not traditionally served with chilaquiles, you will find them served with eggs in Mexico. Given my love affair with eggs, especially for breakfast and brunch, I have included an egg (any style) with mine, but they’re certainly optional. If you’re following a vegan diet, omit the eggs and the crumbled cotija. My first experience making chilaquiles was about 30 years ago when I only had 3 of my 4 boys. I loved the Moosewood Cookbooks, and made a vegetarian version for the boys. They weren’t really gung-ho about my vegetarian meals (and Moosewood meals in general), but they did like my chilaquiles. They’ve made an appearance on Saturday mornings ever since. I start with stale tortilla strips sprayed with cooking spray then baked in a 375° oven until brown and crispy. 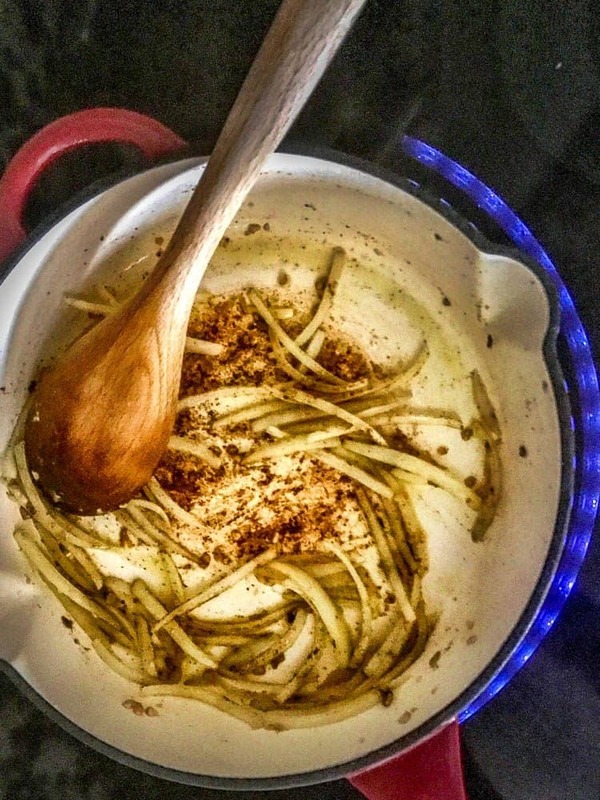 While the tortilla strips bake, add the oil, onions, and garlic to a sauté pan over medium-high heat. Cook until onion is soft. 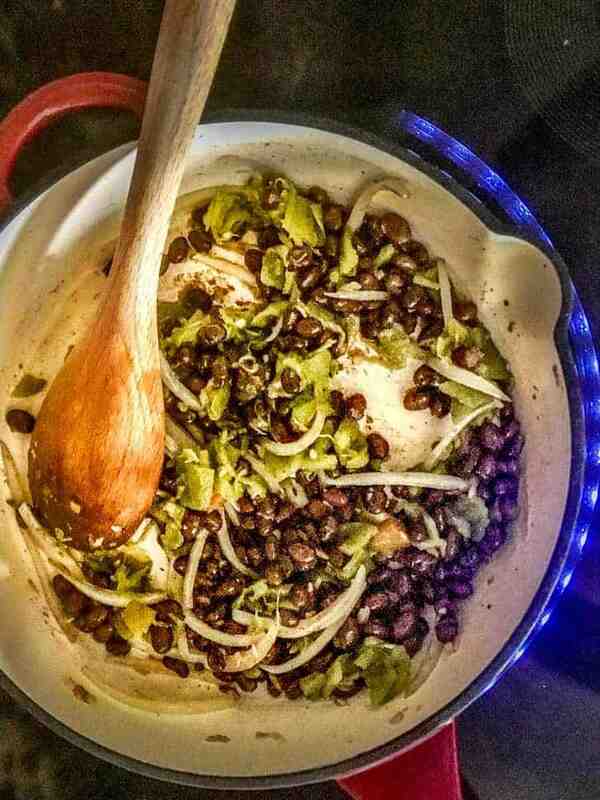 Add black beans and Hatch green chile. Cook an addition 2-3 minutes, stirring occasionally. Add tortilla strips, and about half of the broth. Bring to a boil, then to a simmer. Add additional broth as needed to moisten tortilla strips. When the chilaquiles are done, pile them into ovenproof serving dishes (I love my individual cast iron) and place in a warm oven until ready to serve. While eggs are not typical or required, we love to top our chilaquiles with a runny egg! Cook your favorite style eggs, and top the chilaquiles with an egg and one or more of your favorite garnishes – avocado, cilantro, crumbled cotija, pickled or fresh jalapeños, chopped scallions, etc. I hope you’ll give this healthy and flavorful dish a try… It’s a favorite at Andersen casa! 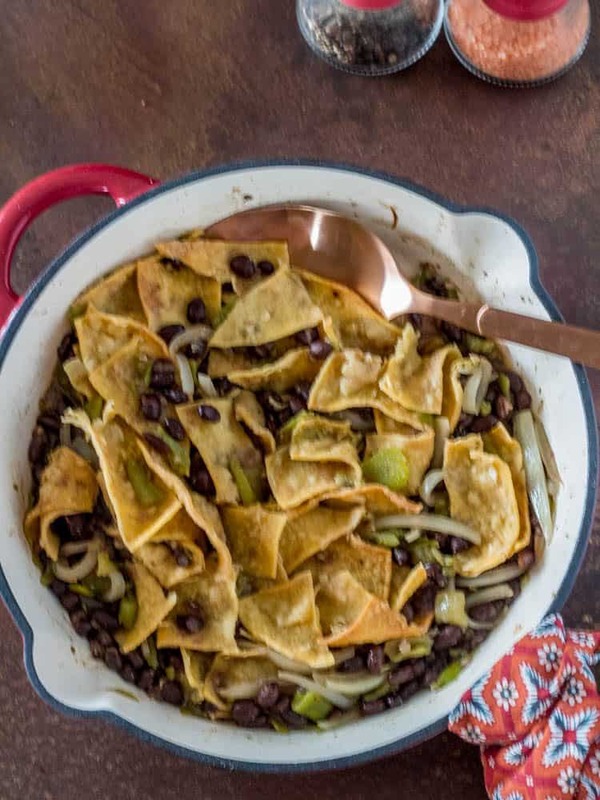 Hatch green chile, black beans, and corn with crisped baked tortilla strips soak up veggie broth before getting topped with an (optional) egg, crumbled cotija, and cilantro! 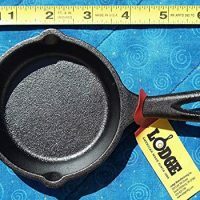 To a good-sized sauté pan over medium-high heat, add the oil, onion, and garlic. Cook until onion is soft and translucent. Add the cumin. Sauté another minute or two until fragrant. Add the black beans and Hatch green chile. Stir to combine. Add the baked or fried tortilla strips, then pour about half the broth over top. Stir, and press tortilla strips into the mixture. Add more broth as needed. Mixture should be moist not soupy. Season with salt and pepper. Taste it! Cook eggs according to preference. 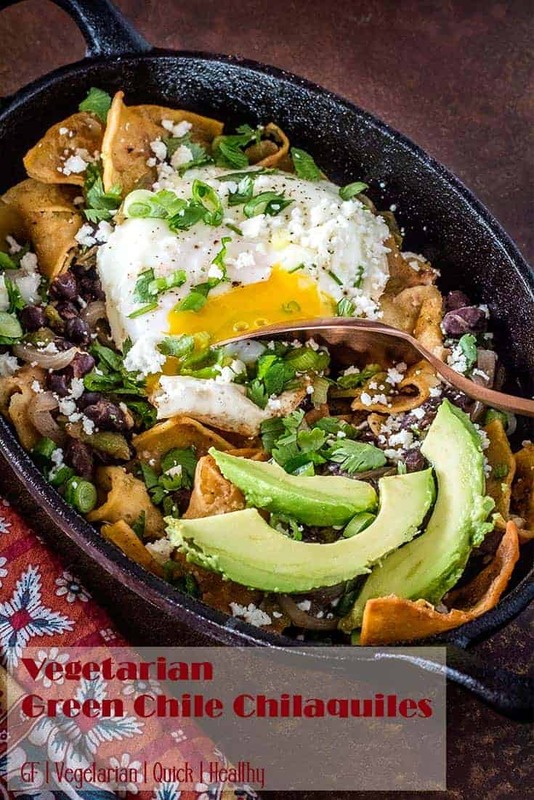 As I mention in the post, eggs aren't traditionally a part of chilaquiles, though you will definitely find them in recipes and restaurant menus. We typically start our day, and basted soft eggs are our "go to" egg. Choose your favorite! I prep all my garnishes up front, then pop the chilaquiles in a preheated warm oven (from baking the tortilla strips) to stay warm while I make the eggs. 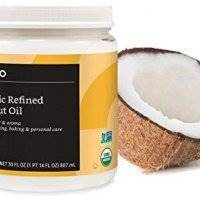 Macronutrients from MyFitnessPal.com are an approximation only! Does not include garnishes or egg. It is very interesting to look at all of the different ways chilaquilas are made in different countries. They all look good to me. Normally I make mine with red chile, but I love yours with green chile and all of the tasty toppings. Looks like a wonderful brunch for this weekend since I have all of the ingredients. Thanks! And like you...I love the egg on top. Chilaquiles are an interesting dish indeed! 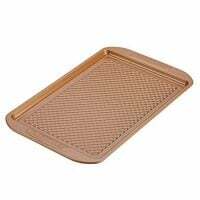 Home cooks, restauranteurs, even street vendors have their own versions... I love them all! Thanks for stopping by MJ!